As we enter 2014, none of us can deny that search engines such as Google play a major role in our small-medium sized business success. We want our customers to find us on the web- but more so, we want customers searching for solutions to find us first. Different from someone typing in your website specifically, you want someone searching for “Best Greek Restaurants in NJ” to find your restaurant, or “Facelift in NYC” to find your plastic surgery website. In order to have your website link come up on search engines (and stand out) to potential customers searching relevant keywords, you must make a decision: PPC (pay per click) advertising or building organic SEO. PPC is paying to come up for certain keywords on search engines. This tactic may provide an immediate influx of clicks to your website, yet it may be expensive depending on the amount of people competing to come up for the same keywords. The downside of PPC is that once you end your campaign, your website will drop off of search engines completely. By solely using PPC campaigns you will always have to advertise and be at the mercy of keyword costs-which can be an uphill battle for some in a competitive space. Organic SEO is to make your website search engine friendly, by doing a number of tactics to make search engines like and trust your website- therefore having it organically come up in search engines for keywords. This takes time to build up, yet unlike PPC, these results do not revert. Coming up organically for keywords is the best possible outcome for your website. 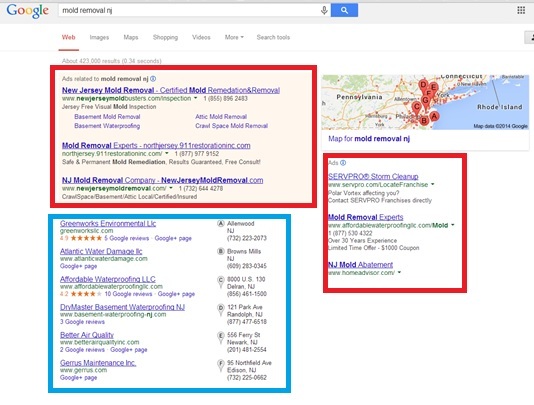 Finally it is important to note, that where your website comes up on Google will be different if using PPC vs. SEO. [See Image Below-Red represents PPC placements, Blue represents organic (SEO) results] This is important to note because studies show that roughly 70 percent of people searching will click the organic results, versus 30 percent of people who will click on the PPC results (ads). What Does PPC Involve/How Does it Work? PPC: Pay Per Click advertising is exactly what is sounds like. You are paying for an advertising spot, much like a commercial slot. Setting up a PPC campaign involves choosing which key words you’d like to bid on, such as “Coffee shops in Wayne NJ”. Once you select your key words you will set an amount you’d like to pay for each time your website comes up for that search and someone clicks on your link. Keep in mind, that other people are also bidding on the same keywords (which is a good thing, since you don’t want to pay for keywords that no one is typing in to search engines). However this means that the more competitive the keywords are, the higher you will have to bid to come up on searches. PPC should be monitored closely and changed by amount or keyword depending on the results you receive and the market. How Do I Build Organic SEO? Link building, tactics done on the back end of websites, and P.R. are all ways to build organic SEO. During your consult with X Factor Digital Marketing, we look at the entire picture: your budget, the amount you’d like to put out and would expect to come in with customers and finally the competitiveness of the market. Often times it is not one or the other (PPC or SEO), yet a see-saw of both; a percentage of PPC and SEO which is shifted as per the market and your individual needs. 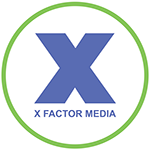 To learn more about SEO and PPC contact X Factor Digital Marketing Today (908) 376-6291 or email info@thexfactorteam.com!